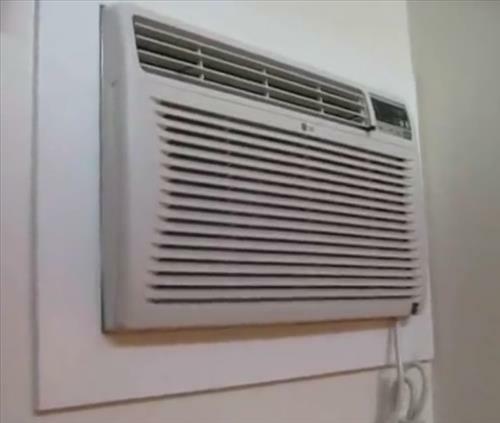 Not all air conditioners are the same when it comes to the noise they make. Some are barley noticeable while others can create a racket that can become annoying to say the least. Through-the-wall air conditioning units are no exception and along with window mounted A/C units are the loudest. The reason they are the loudest is the main noisy part is the compressor which is located inside the packaged unit. Unlike a traditional A/C unit which has the compressor located outside. With that said some through the wall A/C units that are quieter than others. Keep in mind there are also other options to get a cheap quite air conditioning unit such as mini split which locate the compressor outside. Mini split units require more work to install and setup than a through-the-wall unit but is a good option for a knowledgeable do-it-yourself type of person. What are the Quietest Through the Wall Air Conditioners? One of the best ways to find the quietest A/C unit is to read reviews online such as Amazon and forums. After installing many though-the-wall air conditioners, below are the best units I have setup and have been using. This unit from Koldfront is very popular and can cool a space up-to 450 square feet. 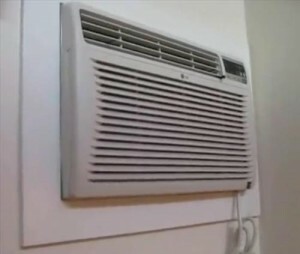 It is a 10,000 BTU 115 Volt unit built to slide into a wall. The dimensions are listed as 14.5 inches High, 24.2 inches Wide and 20.3 inches Deep. Koldfront also has a 8,000 and 12,000 BTU units if less or more cooling power is needed. Keystone has been around for many years and builds this 12,000 BTU 115 Volt unit. It is rated to cool a space up-to 550 square feet, of course climate and how well insulated a home is should be taken into consideration. While all packaged A/C units make noise the Keystone KSTAT12-1B is a well built unit that when installed properly keeps the noise minimal. Frigidaire is a well known manufacture and makes this 10,000 BTU 230 Volt model. One of the reasons this unit is quiet is that a compressor can run much more efficiently on 230 volts than 115 volts. 220 volts is not common in most homes and is usually only use for hot water heaters or dryers. While running a 220 volt line is always an option it may not be for everyone. LG is another well known manufacture and makes a few though-the-wall units. They have 8,000, 9,800, and 11800 BTU with the 8,000 BTU unit able to cool a space up-to 330 square feet. It has a SEER rating of 10.7 which is how efficient the unit will operate when running. While packaged units are the easiest to install mini split units are by far the quietest and low cost to operate. Mini split units can barley be heard and have very high SEER ratings usually 17-23 SEER. They are more work to install but have several DIY mini splits kits that come with most everything needed. I have installed many mini split units and always recommend them as they are very quiet and can reduce electrical bills drastically from a packaged unit. They also heat and cool so can be used during the winter and summer. Pioneer is one of the more popular options that come in different sizes and voltages. Read Here to See Other Mini Split Options. Spend the extra money and buy American made. Thanks for the info. I need to replace a wall ac unit and loudness is an important factor for me.